Chronic fatigue syndrome (CFS) was the first of these multisystem illnesses to be proposed to be caused by a vicious cycle (1-8) that has recently been named the NO/ONOO- (no, oh no!) cycle (8) and is still one where an increasingly strong case for this etiology can be made. While the first two of these are implicated most commonly in the initiation of CFS cases, we need explanations for the apparent roles of all nine. The fact that all nine can initiate a sequence of events that leads to increased nitric oxide synthesis must be considered to be a striking coincidence that provides a key clue to CFS etiology. Indeed the genetic evidence implicating corticosteroid-binding globulin gene (10,11) and the serotonin transporter gene (12) in determining susceptibility to CFS also provides support for a nitric oxide role in CFS initiation because both of these genes can act to determine cortisol function and cortisol is known to lower the induction of the inducible nitric oxide synthase (iNOS) and therefore partially determine levels of nitric oxide (8). Of the nine stressors listed above, the first three act primarily by inducing iNOS, as does stressor 9 (1,2,8). Most of the others act, at least in part, by increasing NMDA activity which acts, in turn, through the other two nitric oxide synthases, nNOS and possibly eNOS (2,8). Thus the common feature is the increase in nitric oxide, not the specific form or forms of nitric oxide synthase involved. The connection between each of the first six and nitric oxide is very clear. I’d like to discuss the last three. Number 7, severe psychological stress has been mainly linked to nitric oxide synthesis through animal models of posttraumatic stress disorder, where it has been shown to increase NMDA activity and consequently levels of nitric oxide (7). Ciguatoxin exposure is known to greatly delay closing of certain sodium channels and this is known, in turn to be able to stimulate NMDA activity. The role of ciguatoxin in increasing nitric oxide levels is inferred, therefore, from the known role of NMDA receptors activity in increasing nitric oxide and its oxidant product peroxynitrite. Ionizing radiation initiates cases of postradiation syndrome, a CFS-like illness. Ionizing radiation is known to act to stimulate the transcription factor NF- k B, leading in turn to increased iNOS activity and consequent nitric oxide. It can be seen, from the above, that the pattern of evidence implicating elevated nitric oxide synthesis activity in the initiation of CFS cases is quite striking. How can nitric oxide act to initiate these illnesses? By acting mainly through its oxidant product peroxynitrite to initiate the vicious cycle mechanism (1), the NO/ONOO- cycle, that is responsible for chronic illness. The NO/ONOO- cycle mechanism, given previously on my main web page, book (8) and elsewhere (13,14), is presented again below in Fig. 1. Fig. 1 legend. Vicious (NO/ONOO-) cycle diagram. Each arrow represents one or more mechanisms by which the variable at the foot of the arrow can stimulate the level of the variable at the head of the arrow. It can be seen that these arrows form a series of loops that can potentially continue to stimulate each other. 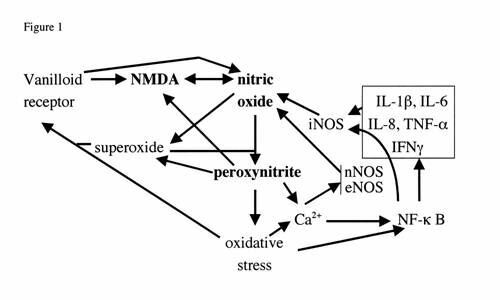 An example of this would be that nitric oxide can increase peroxynitrite which can stimulate oxidative stress which can stimulate NF- k B which can increase the production of iNOS which can, in turn increase nitric oxide. This loop alone constitutes a potential vicious cycle and there are a number of other loops, diagrammed in the figure that can collectively make up a much larger vicious cycle. The challenge, according to this view, in these illnesses is to lower this whole pattern of elevations to get back into a normal range. You will note that the cycle not only includes the compounds nitric oxide, superoxide and peroxynitrite but a series of other elements, including the transcription factor NF- k B, oxidative stress, five inflammatory cytokines (in box, upper right), all three different forms of nitric oxide synthases (iNOS, nNOS and eNOS), and two neurological receptors the vanilloid receptor and the NMDA receptor. Are NO/ONOO- Cycle Elements Elevated in the Chronic Phase of CFS? The mechanisms involved in the NO/ONOO- cycle are discussed in many of my papers () and summarized most completely in my book (8). One very important question is in determining whether any specific chronic disease/illness is a NO/ONOO- cycle disease is whether elements of the cycle are elevated in the chronic phase of illness. The answer, in CFS as is also true of the other multisystem illnesses, MCS, FM and PTSD is where they have been looked at, they are elevated! 1. Oxidative stress has been reported in 13 studies of CFS, published by seven research groups on four continents (5,8). Such oxidative stress is also supported by reports of glutathione depletion and cyst(e)ine depletion in CFS (15,16) and by reported depletion of essential fatty acids in CFS (17,18). Oxidative stress is expected to lead to both glutathione/cysteine depletion and essential fatty acid depletion as I proposed earlier (1). Thus oxidative stress is probably the best documented change in CFS. Having said that, it is not a specific response to CFS! Many inflammatory diseases will lead to elevation of markers of oxidative stress and in addition, many cases of CFS (presumably among the more modestly effected) fall into the “normal” range of these markers. The same pattern occurs with many other changes that are reported in CFS, where on average there are statistically significant changes but many individual CFS cases fall well within the normal range. 2. Mitochondrial/energy metabolism dysfunction is part of the NO/ONOO- cycle mechanism because peroxynitrite attacks a number of components of mitochondria, and nitric oxide and superoxide also inhibit certain mitochondrial functions (8). 18 different studies provide evidence for mitochondrial and/or energy metabolism dysfunction in CFS (reviewed in 1,8). This again provides extensive evidence supporting NO/ONOO- cycle biochemistry in CFS. Among these are studies showing that agents predicted to improve mitochondrial function such as carnitine/acetyl carnitine, coenzyme Q10 and lipids designed to help regenerate the mitochondrial inner membrane are all helpful in the treatment of CFS. These provide evidence that not only is there mitochondrial dysfunction but that it contributes to the CFS pathophysiology. 3. Two studies report increased nitric oxide levels (3,19). In addition, studies of neopterin levels, a marker of high level iNOS induction reported statistically significant elevation in three of five studies of CFS, suggesting that iNOS induction contributes to the nitric oxide elevation (1). The hydroxocobalamin form of vitamin B 12, a potent nitric oxide scavenger (4) was reported to produce statistically signficant improvements of CFS-like patients in a placebo-controlled trial (20). Hydroxocobalamin has been used clinically to treat CFS-like illnesses for over 60 years, being used in at least 9 countries on three continents, mainly by IM injection. Patients report rapid improvement of their entire spectrum of symptoms in response of hydroxocobalamin injection. The pattern of apparent efficacy suggests that not only is nitric oxide elevated in CFS, but that it contributes in a major way to its etiology. 4. There are 10 studies that report that one or more of the inflammatory cytokines in the right, upper corner of Fig. 1 are elevated in CFS (8). These elevations are relatively modest suggesting that they contribute to but do not dominate the CFS etiology. 5. Two physicians and one research group report clinical observations supporting an elevation of NMDA activity in CFS, again supporting the NO/ONOO- cycle etiology (8). While these are the main observations supporting a NO/ONOO- cycle etiology, there are some additional clinical observations from therapies that may also suggest elevation of cycle components. For example, some physicians have used agents known to lower NF- k B activity as part of their CFS treatment protocols and others have used the drug guaifenesin, a drug reported to lower capsaicin responses and therefore vanilloid receptor action. The drug thiacetarsamide was reported by Tarello to produce great improvement animal models of CFS and has been found by me to scavenge both nitric oxide and peroxynitrite (all reviewed in 8). These studies suggest but do not prove both elevation of NO/ONOO- cycle elements and also suggest that lowering those elements produces improvement and that they may contribute, therefore, to the etiology of CFS. Chronic Fatigue Syndrome—Where Should We Search for a Specific Biomarker? Searching for specific biomarkers for specific multisystem illnesses should focus, according to the NO/ONOO- cycle model, on the effects of the impact of that cycle on whatever tissue impact is most characteristic of a particular illness. In the case of MCS, FM and PTSD, the issue of specificity is readily apparent because the most characteristic symptoms or signs of illness are readily apparent. In the case of CFS, they are not. However the recent deliberations on CFS have focussed on the symptom of post-exertional malaise as the most characteristic symptom (21) and it is there that we should focus our search for a specific biomarker, in my view. Post-exertional malaise is a phenomenon where exercise in CFS patients produces an exacerbation of their entire spectrum of symptoms, an exacerbation that the NO/ONOO- cycle model predicts is likely to be due to up-regulation of NO/ONOO- cycle biochemistry. The view that excessive exercise in CFS may up-regulate the basic causal mechanism is supported by some of the pioneering observations of Dr. Melvin Ramsay. Ramsay observed that CFS sufferers who continued to work longest before collapse had a much poorer prognosis than those who were diagnosed early and underwent prolonged bed rest (22). How might one use the phenomenon of post-exertional malaise to develop a specific biomarker for MCS? When I discussed this issue with Dr. Paul Cheney, suggesting that this is where we should focus our efforts to develop a specific biomarker for CFS, he told me that his CFS patients show a characteristic difference from normal controls—whereas normal controls show an increase in corticol levels after exercise, his CFS patients do not. The notion that changes in cortisol response may cause post-exertional malaise in an attractive one. Cortisol (and other glucocorticoids) is known to lower the induction of the inducible nitric oxide synthase (iNOS) and may have a substantial role, therefore, in controlling nitric oxide levels. A deficient cortisol response to exercise may lead, therefore, to increased nitric oxide levels after exercise in CFS patients vs. controls, leading, in turn, to up-regulation of the NO/ONOO- cycle. Is there other evidence supporting a specific deficiency in cortisol control in CFS? After all, the HPA axis control controls cortisol production and HPS axis dysfunction is known to occur in all of the multisystem illnesses (8). Two reviews suggest that HPA axis control in CFS is distinct from that in FM (23,24), consistent with such specificity. Ottenweller et al (25) reported changes in cortisol control in response to exercise in CFS patients, similar to those found by Cheney. Dinan and coworkers reported (26) that the adrenal glands of CFS patients were substantially smaller than those of controls, consistent with an aberration of HPA axis control. Certain other studies also provide support (8). Others have expressed views similar to those I write here. Torpy (27) described CFS patients with “altered dynamic responses to stress, especially cortisol to stimuli.” Neeck and Crofford (28) reported “abnormalities of central components of the HPA axis” in CFS. The prediction, then, is that exercise, acting in part or in whole through aberrent cortisol control, will act in CFS patients to up-regulate NO/ONOO- cycle biochemistry in a response that will not be seen in normal controls . Is there any evidence for this? Jammes et al (29) reported large increases in markers of oxidative stress in CFS patients after exercise, whereas only small increases were seen in controls. LaManca et al (30) reported much larger cognitive deficits after exercise in CFS patients compared with controls, consistent with such cognitive deficits being caused by NO/ONOO- cycle biochemistry. Even the major changes in cardiac function found in CFS patients by Peckerman et al (31,32) and by Cheney (33 and personal communication) may be caused by lowered cortisol levels because cardiac dysfunction in humans and animals can be caused by lowered cortisol levels (reviewed in ref 8, chapter 5). The notion that dysfunctional cortisol control in response to exercise is behind the phenomenon of post-exertional malaise in CFS should allow one to use exercise control of almost any easily measurable NO/ONOO- cycle element to develop a specific biomarker for CFS. In addition, almost any easily measureable symptom or sign of CFS might also be used. My own prejudice is that we should use markers of nitric oxide production before and after exercise, but no doubt others may have other parameters they may prefer to measure. Important relevant evidence supporting a NO/ONOO- cycle etiology for CFS is provided on my main web page and in my book (8), as well as above. The evidence for a presumptive nitric oxide mechanism for initiation is strong for CFS and indeed stronger than it is for the other multisystem illnesses. Elevation of the elements of the NO/ONOO- cycle is supported where these have been studied, but several have not been directly studied. For example, there is no evidence for elevation of vanilloid activity in CFS, unlike in FM and MCS where this has been studies. Peroxynitrite levels have not been studied so the only relevant evidence is derived from evidence for nitric oxide elevation and elevation of parameters that increase nitric oxide (inflammatory cytokines and NMDA activity) and also from evidence for oxidative stress. Similarly, elevation of NF- k B activity has not been studied directly but may be inferred from elevated levels of both the inflammatory cytokines and iNOS, both presumably produced as a consequence of elevated NF- k B. We have the list of nine distinct short-term stressors that can all apparently initiate cases of CFS, all of which can act to start a sequence, leading to increased nitric oxide levels. We have, for the first time an explanation for how this diversity of stressors can lead to a common response – initiation of cases of CFS. CFS is chronic because of the action of the NO/ONOO- cycle mechanism. We can explain the generation of both non-specific and specific symptoms and signs of CFS, the latter discussed here and the former in my book (8). We can explain its comorbidity with other multisystem illnesses and of other well-accepted diseases such as migraine and asthma as being due to each of these illnesses having similar causal mechanisms. We can explain the action of certain agents and entire treatment protocols which appear to be effective in the treatment of CFS, some discussed above and others discussed on my main web page and in my book (8). Indeed it is the great promise of this mechanism as a predictor of therapeutic approaches that is its most important feature for the many who suffer from CFS and related illnesses. We can explain the stunning variation, both quantitative and qualitative in the symptoms and signs of illness among CFS patients and, indeed, among patients of the whole group of multisystem illnesses. It has been the many previously unexplained features of CFS and these multisystem illnesses that has led others to argue we needed a new paradigm of human of disease in order to explain them. That is exactly what we have. 1. Pall ML. 2000 Elevated, sustained peroxynitrite levels as the cause of chronic fatigue syndrome. Med Hypoth 54:115-125. 2. Pall ML. 2000 Elevated peroxynitrite as the cause of chronic fatigue syndrome: Other inducers and mechanisms of symptom generation. J Chronic Fatigue Syndr 2000;7(4):45-58. 3. Pall ML. 2002 Levels of nitric oxide synthase product citrulline are elevated in sera of chronic fatigue syndrome patients. J Chronic Fatigue Syndr 10(3/4):37-41. 4. Pall ML. 2001 Cobalamin used in chronic fatigue syndrome therapy is a nitric oxide scavenger. J Chronic Fatigue Syndr 8(2):39-44. 5. Smirnova IV, Pall ML. 2003 Elevated levels of protein carbonyls in sera of chronic fatigue syndrome patients. Mol Cell Biochem 248:93-95. 7. Pall ML. 2001 Common etiology of posttraumatic stress disorder, fibromyalgia, chronic fatigue syndrome and multiple chemical sensitivity via elevated nitric oxide/peroxynitrite. Med Hypoth 57:139-145. 8. Pall ML. 2007 Explaining “Unexplained Illnesses”: Disease Paradigm for Chronic Fatigue Syndrome, Multiple Chemical Sensitivity, Fibromyalgia, Post-Traumatic Stress Disorder, Gulf War Syndrome and Others, Haworth Medical Press, in press. 9. De Meirleir K, De Becker P, Nijs J, et al. 2002 CFS etiology, the immune system, and infection. In Chronic Fatigue Syndrome, A Biological Approach, P. Englebienne and K De Meirleir, eds, CRC Press, Boca Raton, pp. 201-228. 10. Torpy DJ, Bachmann AW, Grice JE, et al. 2001 Familial corticosteroid-binding globulin deficiency due to a novel null mutation: association with fatigue and relative hypotension. J Clin Endocrinol Metab 86:3692-3700. 11. Torpy DJ, Bachmann AW, Gartside M, et al. 2004 Association between chronic fatigue syndrome and the corticosteroid-binding globulin geen ALA SER224 polymorphism. Endocrine Res 30:417-429. 12. Narita M, Nishigami N, Narita N, et al. 2003 Association between serotonin transported gene polymorphism and chronic fatigue syndrome. Biochem Biophys Res Commun 311:264-266. 13. Pall ML. 2002 NMDA sensitization and stimulation by peroxynitrite, nitric oxide and organic solvents as the mechanism of chemical sensitivity in multiple chemical sensitivity. FASEB J 16:1407-1417. 14. Pall ML. 2005 Multiple chemical sensitivity: towards the end of controversy. Townsend Lett Doctors Patients Aug/Sept 2005:52-56. 15. Bounos G, Molson J. 1999 Competition for glutathione precursors between the immune system and the skeletal muscle: pathogenesis of chronic fatigue syndrome. Med Hypoth 53:347-349. 16. Droge W, Holm E. 1997 Role of cysteine and glutathione in HIV infection and other diseases associated with muscle wasting and immunological dysfunction. FASEB J 11:1077-1089. 17. Horrobin DF. 1990 Post-viral fatigue syndrome, viral infections in atopic eczema, and essential fatty acids. Med Hypoth 32:211-217. 18. Liu Z, Wang D, Xue Q, et al. 2004 Determination of fatty acid levels in erythrocyte membranes in patients with chronic fatigue syndrome. Nutr Neurosci 6:389-392. 19. Kurup RK, Kurup PA. 2003 Hypothalamic digoxin, cerebral chemical dominance and myalgic encephalomyelitis. Int J Neurosci 113:445-457. 20. Ellis FR, Nasser S. 1973 A pilot study of vitamin B 12 in the treatment of tiredness. Br J Nutr 30:277-283. 21. Carruthers BM, Jain AK, De Meirleir KL, et al. 2003 Myalgic encephalomyelitis/chronic fatigue sydnrome: clinical working case definition, diagnostic and treatment protocols. J Chronic Fatigue Syndr 11(1):7-115. 22. Ramsay MA. 1988 Myalgic Encephalomyelitis and Postviral Fatigue State: The Saga of Royal Free Disease, 2 nd Ed, Gower, London. 23. Demitrack MA, Crofford LJ. 1998 Evidence for and pathophysiologic implications of the hypothalamic-pituitary-adrenal axis dysregulation in fibromyalgia and chronic fatigue syndrome. Ann N Y Acad Sci 840:684-697. 24. Adler GK, Manfredsdottir VF, Rackow RM. 2002 Hypothalamic-pituitary-adrenal axis function in fibromyalgia and chronic fatigue sydrome. The Endocrinologist 12:513-524. 25. Ottenweller JE, Sisto SA, McCarty RC, Natelson BH. 2001 Hormonal responses to exercise in chronic fatigue syndrome. Neuropsychobiology 43:34-41. 26. Scott LV, The J, Reznek R, Martin A, Sohaib A, Dinan TG. 1999 Small adrenal glands in chronic fatigue syndrome: a preliminary computer tomography study. Endocrinology 24:759-768. 27. Torpy DJ. 2001 Neuroendocrinology, genetics and chronic fatigue syndrome. CFS Res Rev 2(4):1-3. 28. Neeck G, Crofford LJ. 2000 Neuroendocrine perturbations in fibromyalgia and chronic fatigue syndrome. Rheum Dis Clin North Am 26:989-1002. 29. Jammes Y, Steinberg JG, Mambrini O, et al. 2005 Chronic fatigue syndrome: assessment of increased oxidative stress and altered muscle excitability in response to incremental exercise. J Intern Med 257:299-310. 30. LaManca JJ, Sisto SA, DeLuca J, et al. 1998 Influence of exhaustive treadmill exercise on cognitive functioning in chronic fatigue syndrome. Am J Med 105(3A):59S-65S. 31. Peckerman A, LaManca JJ, Dahl KA, et al. 2003 Abnormal impedance cardiography predicts symptom severity in chronic fatigue syndrome. Am J Med 326:55-60. 32. Peckerman A, LaManca JJ, Qureshi B, et al. 2003 Baroreceptive reflex and integrative stress responses in chronic fatigue syndrome. Psychosom Med 65:889-895.